e-payment solutions provider Worldline has chosen XJTAG boundary scan over its previous solution as part of a test strategy created to ensure absolute trust in the technology supporting its services. Aided by XJTAG’s test-development expertise, Worldline is benefiting from 30% higher test coverage, 60% lower test hardware costs and 50% faster test cycle time. Worldline is highly regarded throughout the banking industry for excellent security. To protect this reputation, the company’s engineers have created a robust test regime for equipment such as its payment terminals, which feature built-in tamper checking that protects the unit’s secure memory to prevent hackers accessing any useful data. Working with Logic Technology, an embedded development consultant and XJTAG distributor in Benelux, Worldline engineers selected XJTAG’s XJRunner system to test this critically important aspect of the terminal’s functionality. XJRunner is used on the production line at Worldline’s manufacturing partner, and also for in-house test and repair. In addition, Worldline is extending the use of the system throughout its global Value Added Reseller (VAR) network. This gives the VARs flexibility to test or re-flash boards locally and so save the time and costs of returning boards to Belgium. Over 40 systems are currently deployed worldwide, with many more planned for the future. XJTAG is supporting Worldline with test-development and maintenance services that enable engineers to access the latest versions of boundary scan tests. The XJTAG partnership allows Worldine to focus on its core technology and benefit from the latest developments in test while reducing overall deployment costs. “The service from XJTAG is competitively priced and offers outstanding flexibility and competencies that support our test requirements,” explains Leone Alfano, Industrialization Test Specialist at Worldline. XJRunner is a run-time boundary scan environment optimised for production-line use. It provides layout and schematic viewers to aid fault finding. XJRunner can test multiple boards simultaneously, and is compatible with commonly used serial-numbering systems. Worldline has integrated XJRunner into a custom test station based on National Instruments’ LabVIEW™, taking advantage of the XJTAG .NET API and Virtual Instruments (VIs) to complete the integration quickly and efficiently. “The support provided to facilitate integration with LabVIEW makes XJTAG really stand out against other systems,” confirms Leone Alfano. By integrating XJRunner so successfully with LabVIEW, Worldline has been able to take advantage of XJTAG boundary scan to verify power-supply voltages and also to automate the testing of RF circuitry. The RF test routine uses XJRunner to enable the board’s transmitter output, allowing the test station to automatically verify the RF carrier signal using a digital oscilloscope. XJRunner then disables the transmitter to terminate the test. The service from XJTAG is competitively priced and offers outstanding flexibility and competencies. The support provided to facilitate integration with LabVIEW makes XJTAG really stand out against other systems. We are using XJTAG at every stage of the product lifecycle. Since introducing it, we have increased test coverage by at least 30% while halving test cycle time and saving 60% of test hardware costs. We are very pleased with the results. 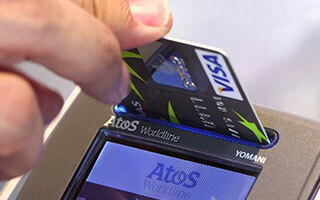 Worldline, an Atos company, is a leader in electronic payment solutions, and offers a complete end-to-end service that includes all the technology from the payment terminal to the secure network used for validation, and the servers that verify the transactions. Worldline payment solutions are in action every day, around the globe.